“The counterinsurgency strategy the U.S. is employing in Afghanistan may be the template for war for the next generation. But critics say it overreaches—and could lead to a succession of mini-Vietnams.” So reads the lead to a feature article titled “The future of war” in the October 2, 2009 issue of The Christian Science Monitor. I side with the critics. Thirty-five years ago this August, I arrived as a Foreign Service Officer with my young family in Islamabad, Pakistan. I spent the next 18 months there working as an agricultural economist for the U.S. Agency for International Development (USAID), the economic development arm of the State Department. This experience has been much on my mind recently as the U.S. searches for sensible policies in Afghanistan and next-door neighbor Pakistan. The Obama administration correctly sees the Afghanistan and Pakistan internal conflicts as intricately intertwined, and State Department veteran Richard Holbrooke has been assigned to coordinate and direct civilian policies as Special Representative. The New Yorker’s September 28, 2009 issue has an excellent article by George Packer on Holbrooke’s current efforts in this role. So-called counterinsurgency strategies, like the earlier pacification programs in then South Vietnam, call for combining local economic development efforts with military security on the ground. The theory sounds good. But it requires a massive military presence to provide sufficient security for the economic development activities to be carried out. And it requires a long-term commitment. Is the U.S. really prepared to have large numbers of troops in Afghanistan for many years to come? I don’t think so. The ‘volunteer’ army is greatly overstretched, and the multiple tours of duty in Iraq and Afghanistan are placing impossible strains on troops and their families. Unless the broader U.S. public is willing to share the burden and pain through a draft—which seems highly unlikely—I do not see how a long a long-term counterinsurgency campaign is feasible. My USAID stint in Pakistan, in 1974-76, occurred during a period of relative (for Pakistan) political stability. Pakistan was recovering from the civil war that resulted in East Pakistan splitting off into the new political entity of Bangladesh a few years earlier, and an elected civilian government was in place. Zulfiqar Ali Bhutto, the father of Benazir Bhutto (who was assassinated in December 2007), was president. USAID and the World Bank had major economic assistance programs in Pakistan at that time, many of them focused on agricultural development. At the time, it appeared that some success was being achieved through these efforts. But even then, in ‘peacetime’, foreign assistance efforts were severely constrained. Pakistan was then, and remains now, a basically ‘feudal’ country in the rural areas. The Bhuttos themselves came from a large landlord family in Sindh Province. Democratic institutions at the local level were largely absent. There was, and continues to be, a very low adult literacy rate—55 percent at present. Such constraints made it extremely difficult for outsiders to design and carry out programs that might transform the lives of people at the bottom rungs of the economic ladder. My reading of noted Pakistani journalist Ahmed Rashid’s 2008 book, Descent into Chaos: The United States and the Failure of Nation Building in Pakistan, Afghanistan, and Central Asia, leads me to believe that amazingly little progress has been made during the last three decades in transforming Pakistan from a feudal to a modern democratic society. Many would view with considerable cynicism Pervez Musharraf’s recent statement to an audience at Augustana College that one of his accomplishments in Pakistan was introducing “an essence of Democracy” (Argus Leader, October 3, 2009). Musharraf was the latest in a series of military dictators who have periodically overthrown civilian governments during Pakistan’s chaotic political history since receiving independence (along with India) from the United Kingdom in 1947; he led Pakistan from 2001 to 2008. If carrying out economic development in Pakistan is difficult, imagine what it must be like in Afghanistan, where national and local institutions are even less developed and the security situation is far worse than in most of Pakistan. The U.S. government is now attempting to recruit agricultural experts to serve in Afghanistan, but I think it highly unlikely that there will be many qualified American applicants for those positions, given the extreme risks experts would face in the country. Although there are no doubt many crying needs for agricultural and other economic development assistance in Afghanistan, underlying any potential strategy is the issue of poppy production. The U.S. and its NATO allies reportedly have backed off from many of the efforts to destroy poppy fields and otherwise try to directly halt poppy production in Afghanistan. Those policies surely created tremendous resentment on the part of smallholder farmers. 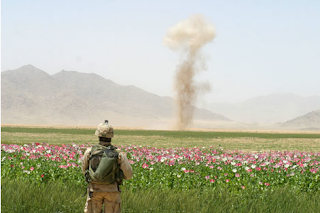 Instead, U.S. and NATO poppy control policies are concentrating on opium drug dealers instead of crop eradication, according to The New Yorker article by George Packer. Packer mentions a recent visit of Richard Hollbrooke with the Provincial Governor of Helmand, a major poppy production region of Afghanistan. Hollbrooke and the Governor discussed “whether the price of this year’s wheat harvest would be high enough to dissuade farmers from planting poppies”. It is difficult to know the larger context of that conversation, but I hope that Hollbrooke and his associates are not operating under an illusion that wheat prices are ever likely to be sustained at levels high enough to provide much incentive for peasant farmers to voluntarily switch from poppies to wheat. The difference in profits per unit of land is enormous, and will remain so as long as the demand for opium remains strong. At least as far back as my time in Pakistan during the 1970s, the U.S. had programs that attempted to wean farmers in the North West Frontier Province and Tribal Areas from poppy production. But these programs had little effect. Poppy production was simply too profitable. (I have a photo in my files, taken on a weekend drive, of my wife walking in a poppy field not far from Islamabad, with farm laborers openly harvesting poppy resin in the same field.) Authorities may temporarily shut down poppy production in a particular region if military and police efforts are harsh enough, but production usually will just move around to some other region in Afghanistan, Pakistan, or other nearby countries. During the presidential election campaign, Barack Obama began to advocate incursions from Afghanistan into the mountainous border regions of Pakistan, to pursue al-Qaeda and Taliban fighters who take sanctuary there. I was baffled at the time, wondering if Obama had any real comprehension of the terrain of eastern Afghanistan and the frontier regions of Pakistan. I have seen some of that terrain on the Pakistan side. 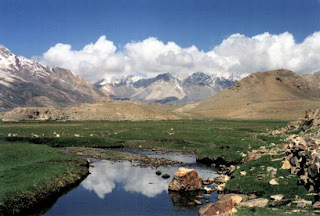 It would be insane, in my view, to commit American troops in those rugged and remote regions of Pakistan. Pilotless drones are being used for such incursions, but that kind of high-tech weaponry requires good ground verification, something that is often lacking—with sometimes tragic consequences for innocent civilians. Moreover, many Pakistanis view the use of drones on their territory as an unwarranted foreign military intrusion, just as would we if the Mexican government were to use drones to target drug kingpins in Arizona. Current events in Pakistan and Afghanistan have a back to the future feel for me. This leads me to the following recommendations concerning U.S. policy options for this part of the world. One, recognize our limits. It is difficult to transform whole societies. That is true in peacetime, but even truer when there is major violent conflict underway. I do not believe the U.S. and our NATO allies can impose military solutions in Afghanistan or the borderlands of Pakistan, even military solutions carried out in a counterinsurgency context. Two, continue to offer economic and other institution building assistance to Afghanistan and Pakistan to the extent the assistance can be effectively utilized and if the poor and powerless are helped, not harmed, by such assistance. For all the positive things U.S. assistance may have accomplished in decades of economic assistance to Pakistan—increased cereal crop productivity, for example—almost nothing has been accomplished in terms of creating a more democratic, just, and egalitarian society. Many millions of people in Pakistan remain desperately poor, powerless, and without a fair and reliable justice system. The more closely associated the U.S. is with governments that perpetuate unjust systems in their countries, the more the U.S. is tainted. We ultimately face a backlash. In 1977, a year after I left the USAID offices in Islamabad, the civilian government of Zulfiqar Ali Bhutto was overthrown in a military coup. Bhutto himself was later imprisoned and executed by the military government of General Zia ul-Haq. The U.S. Embassy in Islamabad was burned by a student mob in 1979. These events caused me to more fully comprehend why the USAID Mission Director in Islamabad during the time I was there lent the front portion of the quite fine building that USAID owned to several United Nations agencies. The United Nations identification was on the front of the building and the front gate, not USAID identification. United Nations employees had the big, glass-front offices facing the boulevard, while we USAID employees were in cramped offices in the back part of the building. But the USAID Director’s rationale was that although U.S./Pakistan relations were good at the time (mid-1970s), you never knew when political events could turn, and the U.S. might be vilified and threatened by mob action. If and when that time came, he wanted the USAID offices to have a very low profile. How right he was! It was the U.S. Embassy building, very conspicuous a mile or so away, that the mob burned, not the USAID building. Sometimes a low profile is not such a bad thing. This blog was adapted from an October 10, 2009 column in The Dakota Day, titled “Back to the future in Pakistan, and implications for U.S. policies in Afghanistan” by Thomas Dobbs, Professor Emeritus of Economics at South Dakota State University. Tom is our guest blogger this week. Walking into the kitchen the other day, I caught an interview with Donovan Campbell on NPR. He's an Iraq vet who served two tours of duty there and the author of the book Joker One. One of the situations he described took my breath away. He and his Marines were charged with cleaning out a housing complex, detaining possible insurgents. They were going about this process, in the middle of the night, busting into homes and waking frightened families. The detainees were taken to waiting trucks at the end of the road. Campbell said the families of the detainees began lining the side of the road, wailing their grief. Women and children were crying, pleading, even beating themselves in their fear and despair, believing they would never see their husbands and fathers again. Campbell said he and his men were deeply disturbed by the scene. They wanted to tell the women and children they were not bad people, that they had families of their own. They wanted to say, this detention is precautionary, your husbands and fathers will probably be alright. But of course, they didn't know Arabic and couldn't communicate with the people and, ultimately, they had no idea what would happen to the men. To make matters worse, as one of the trucks pulled away in the dark, it ran into a ditch and tipped over. Two Marines were injured as well as many of the detainees. The scene became one of chaos and hysteria as the medics tried to relieve the suffering and the wailing got worse. Campbell concluded his description with the reflection that they never knew what finally happened with those detainees; whether any of them lived or died or returned to their families. In another situation, the same uncertainty plagued the soldiers. They had been providing cover for a school inspection, attracting the usual crowd of 20-30 children. They also attracted insurgent fire, which hit the children. The scene Donovan describes of child body parts all over the landscape is gruesome, as is the attempt to piece and patch them back together. Eventually, they have to leave this tragedy to an Iraqi ambulance crew and move on to fight another battle. It's good that this book has been written. We need to break through the silence that too often glamorizes war. It also helps put us in touch with the demons many veterans endure, the roots of all those cases of post traumatic stress and suicide we're seeing. But more than ever, it's made me conscious of how diligently we need to work for a fossil fuel free future. I'm reminded of this by a recent article in Truthout from Nick Mottern called "Killing and Dying in the New 'Great Game': A Letter to Members of the U.S. Military on Their Way to Afghanistan." Mottern reminds us of the strategic importance of Afghanistan for securing Caspian Sea area oil and natural gas resources. 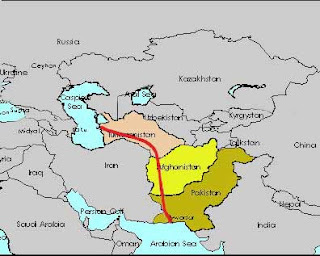 Even when the Taliban were in power, oil execs were trying to negotiate a pipeline across the country. There may be other secondary reasons for our adventures in Iraq and Afghanistan, and the consequent suffering of both warriors and civilians. But fossil fuels and the powerful exploiters of them are certainly the primary reason. The quicker we're able to create sustainable alternatives, in a decentralized manner, the better. In my World Religions class we've been studying Confucianism. 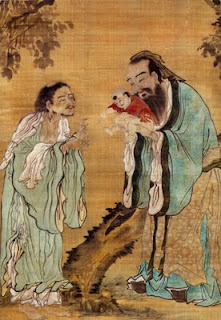 Confucius came into the world at a time of turmoil and disintegration in China. There was full scale tribal warfare and massacres of the innocent. There was nothing that was holding the society together. Missing was what Houston Smith calls the "cake of custom." For Smith, these are the values and traditions one learns in a society, the glue that keeps a given society from coming apart. As always, this dimension of Chinese history gives my class an opportunity to talk about the "cake of custom" in the U.S. In the year 2009, what is it that holds this society together? My students are generally pessimistic about our "cake of custom" and this class was no exception. Most of my students are parents and when they think about where their children learn values and traditions, the only place they can name is in the home. For them, parents generally stand alone. The school, the church, the government, the media, business ... all seem to be encouraging self interest, a "go it alone" mentality, and an amorality that hardly encourages shared purpose and meaning. My students also lamented the difficulty of learning values and traditions through the extended family, as finding time and covering enormous distances make trips to grandmothers house more and more exceptional. For my students, many elements of the society seem more intent on tearing us apart than on holding us together. Faced with turmoil and chaos in China, Confucius went about the process of creating what he called "deliberate tradition." What values and attitudes from the past deserved to be reclaimed? What traditions could be successfully integrated once again into Chinese society? Once these questions were answered, Confucius and others set out to integrate these ideas and values into the very fabric of China, through the games children played, the history they studied in school, the heroes held up as models to be followed. In every conceivable way, the values and traditions chosen were integrated into daily life so people learned them as if by osmosis. I'd like to reclaim a value from our past. It hasn't been totally lost in rural America. The population is so small you still have to depend on your neighbors. The value I want to be deliberate about is neighborliness. If New Orleans had been organized by neighborhoods, maybe people wouldn't have been left without transportation in the face of natural disaster. If we still lived in neighborhoods, we might have more community gardens and mom and pop groceries instead of big box stores that monopolize the food industry. If we resurrected neighborhoods, we might have reasonable size schools where our children didn't drown or disappear. If we organized our neighborhoods, Habitat for Humanity groups might spring up all over the country and barn raisings continue. Our neighborhood is organized. We've fought city hall twice and won both times. We've had a history of pot luck dinners in the street, to welcome new neighbors and visit with the old. It means I suggest to my 90 year old neighbor that she get off her roof and I will clean out the gutter for her. It means we tell each other when we're leaving for a few days, knowing that if something needs doing, a neighbor will do it. The Exodus was organized by neighborhoods. Gandhi preached decentralization. Schumacher wrote Small Is Beautiful. We need a society that is human size again and living as neighbors in neighborhood organization can help us do it. Let's be deliberate and resurrect this "cake of custom." I have alternated between sorrow, anger and incredulity since watching for those few brief minutes. Perhaps there was a good outcome. I don’t know if the woman survived. I don’t know how the producers of the show managed the after effects of that segment. I wondered how it is that the exploitation of human suffering and pain, and in this case, obesity, has become a form of entertainment. A houseguest sits in the next room watching daytime TV programming. The volume is low, but not low enough for me to miss the mesmerizing chant of “Jerry! Jerry! Jerry!” as an audience cheers for Jerry Springer. Beginning there and throughout the day the most intimate of personal dilemmas and humiliation are broadcast as entertainment for the world to see. From Jerry to Dr. Phil to Judge Judy to “reality” shows – human pain and conflict seems to be fair game for public entertainment. I try to convince myself that, perhaps, witnessing the conflict and tragedy in the lives of others on the flat screen might elicit compassion, perhaps eventuating in acts of kindness toward others in real life. And I suppose it does in some instances. But the taunting and adversarial shouts from the TV audiences as human beings play out their life dramas in public frequently give the lie to that fantasy, evoking scenes of gladiatorial contests in ancient Roman amphitheaters. Indeed, the exploitive voyeurism that typifies a lot of “reality” programming dulls the mind and flattens the ability to respond to human suffering with compassion. Human dignity is violently sacrificed on the altars of shock value and TV ratings. How have we come to this? Hoping to control my frustrations, last night I called my Indian brother on the other side of the world at 2:30 AM, my time, because I could not quiet my thoughts so I could sleep. I was really frustrated because the outcome of my actions, instead of making me closer to people, were separating me from them. 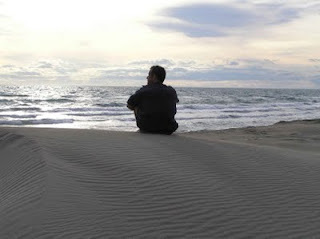 My conscience was calm and happy, but I kept asking myself, why when I do everything by myself to solve a problem, am I relegated outside the community? I was not seeking to be recognized, but simply seeking to be accepted as a part of the community. I knew last night that I had to calm my frustrations so that I would not become angry and violent in thought or action. I knew that if I did not, I would lose my temper if presented with the same problem again. Yes, I know myself very well. Facing the problem again will make me lose my temper. So I was advised to take my time, to be patient and wait for the true outcome of the problem, so I would be capable of seeing the others' point of view. And maybe I needed to understand that the people who had to correct the problem were not comfortable with their solution, or had frustrations too, and that the truth will come in the end. My positive action will lead me to be seen as a respected member of the group. I decided to listen to the advice and went to sleep at 4AM, hoping that in a day or two a good answer would come and help me smooth my frustrations. The next day I woke up at 8:30, late, but ready to face my duties and be worthy of satisfying my needs. I took a minute to shower and jumped into my car. In front of the steering wheel I keep a little piece of a native´s Oaxaca carpet. I saw a piece of thread hanging out of the carpet, so as anyone might do, I pulled it and it broke very easy. Immediately, my mind realized how weak is the control of our emotions, especially when we are frustrated. An anger comes out flashing like the mighty thunder. This control in me is as weak as that thread. It does not take a big force to control our emotions. It is the awareness of our weakness in controlling our temper that is important. I realized that I am capable of not becoming angry, and this awareness can prevent me from the foolishness of becoming angry, which doesn’t solve anything. And knowing that after frustration there is a possibility of violence, we can control ourselves and restrain the violence. Immediately, I took the orange thread and placed it around my wrist like young kids do today. I said to myself, "this is a symbol of your weakness and you should wear it when facing frustration as a tool for controlling your anger and to avoid violence." 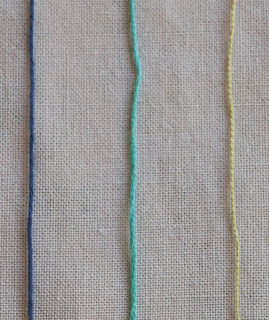 Now I believe that to become nonviolent, we all can use a thread, to remember how weak our control is from frustration to anger. Maybe everybody knows that already, but we have to be aware of it always, anyway. 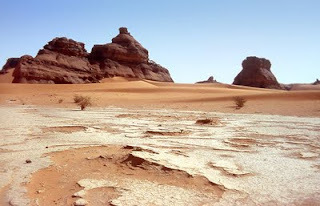 Returning from combat in the Vietnam war, a friend took some spiritual classics and made a pilgrimage to the desert. He stayed there in the wilderness, alone and in silence, till the demons inside had gone quiet. He spoke later about that time of solitude as transforming, likely life-saving. He was there for forty days and forty nights. I'm of the opinion our demons are threatened by solitude, silence, wilderness. Perhaps it's that they prefer a world of distractions, where they can lose themselves in anxiety and busyness and things and routine. A world where surface realties hide the gnawing unease underneath, that threatens to eat out our essentials, till life unexpectedly caves in on itself. Or perhaps it's that demons don't like the natural world, where the sounds of rushing wind and stream replace the noise of automobiles and the flow of sun and stars tells a gentler time. I've seen someone (the only person I've ever known who I thought was truly possessed) flee a wilderness setting, a sacred site at that, because her demon was fearful of healing. One winter I spent a week in rural New Hampshire. It happened during a period in my life when time had become a demon. Time owned me. There was no time I could call my own. So I went to live in a cabin on a lake a few miles off the asphalt. There was no clock, no phone, no electricity, no heat but the fireplace, no water except what I carried from the lake. There were no people. I didn't see a single soul for the whole week. One afternoon, on a beautiful sunny winter day, with the earth covered in an untouched blanket of new snow, I sat in a tree at the edge of a meadow. After an hour, birds joined me in the branches. As the sun set over the hills, I realized the experience had been timeless. My demon had been quieted. But time came back with a vengeance that night. I read by firelight in the evening till I became sleepy. I went to sleep at what I thought was the usual time and when I awoke it was still dark. I felt rested so I rose and read. What seemed like hours later there was still no light in the sky. I began to hallucinate, "what if the sun doesn't rise?" With each new chapter read, and no light in the dark outside, my anxiety increased. My demon laughed. Eventually, I wrote a poem, "What if the Sun Didn't Rise," calming and defeating my demon and watching the sunrise slowly break over the eastern sky. It's not surprising that Jesus was tempted by the devil in the wilderness and the devil was defeated there. Neither is it surprising that Buddha was tempted by Mara under the bodhi tree and she was ultimately defeated when Buddha touched the earth and the earth bore witness to his endeavor. Nor is it surprising that Lakota/Dakota people still go up "on the hill" for direction from their better spirits. For persons committed to nonviolence, being alone in the natural world can be an enormous source of strength for the struggle. And it can be a distinct threat to the demon violence that haunts so many. Thousands of American soldiers have gone absent without leave or filed as conscientious objectors rather than fight in Iraq and Afghanistan. Among them are highly decorated officers and veterans. Military statistics are hard to come by, but the ranks of war resisters within the armed forces appear to be swelling. By refusing to participate any longer in these wars for reasons of conscience, all of these soldiers risk loss of liberty, economic deprivation, social ostracism and even bodily harm. This music video is offered in tribute to these war resisters, as well as the sympathetic but silent comrades they undoubtedly represent. May we stand in solidarity with them, defending their right to the free exercise of conscience, even as we seek the well-being of those soldiers who, choosing differently, continue to fight. May all the troops come home soon. "War will exist," declared President John Kennedy, decades ago, "until that distant day when the conscientious objector enjoys the same reputation and prestige that the warrior does today." To view this video, either click here or watch the embedded video below. Video created by Phyllis Cole-Dai. Original piano music composed and performed by Phyllis Cole-Dai, www.phylliscoledai.com.